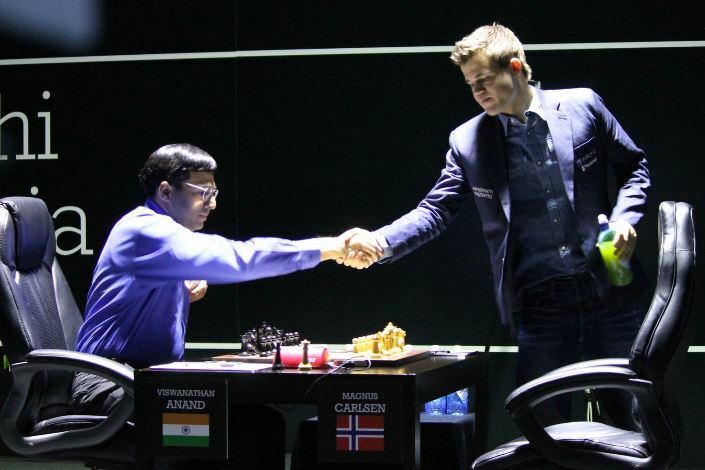 Carlsen-Anand 2014, 4: "Not good enough"
The sequence of blow and counterblow in Sochi was ended as Viswanathan Anand consolidated his win in Game 3 with a hard-fought draw in Game 4 of the 2014 World Chess Championship match. The Indian followed the advice of a legion of armchair generals by playing the Sicilian Defence, but was still steered towards the quietly treacherous territory Magnus Carlsen prefers. Jan Gustafsson and Lawrence Trent are your guides to the events that followed, and which ultimately left the World Champion in a sullen mood. 1. e4 c5! Hats off to Vishy! Somehow the endless 1. e4 e5 Berlins/ Anti-Berlins feel like Carlsen's natural habitat. So Vishy takes the battle somewhere else! 1. d4 with White, 1....c5 with Black. Let's see how it goes. 2. ♘f3 e6! This move offers the best chance of reaching an Open Sicilian. Why? 2... d6 has been Anand's main choice in the past when playing the Sicilian. I'm sure he would be happy to play the Najdorf but the problem is that Magnus has not been allowing him to get there, playing 3. ♗b5+ instead. This leads to a slow positional battle where the World Champion once again feels like a fish in water. 2... ♘c6 is the other main move here, but it does invite 3. ♗b5 yet again. 3. g3⁉ "Sorry Vishy, you did your best, but there will be no open battle here either!" 3. g3 is a Carlsen favorite - at least 4 games in recent times - and the most respectable deviation from 3. d4 nowadays. Yes, that includes 3. c3. White does not aim for anything concrete - he wants to go Bg2 and 0-0 before determining the situation in the centre. Of course Black can use that time to make that choice for him... delaying the central push for one move. 4. ♗g2 d5 Grabbing the centre. This will almost inevitably lead to an isolated pawn on d5. Those who dislike such a scenario should try 4...Nf6, which was played by Caruana in his latest outing against this line. 5. exd5 exd5 6. O-O ♘f6 7. d4 ♗e7 8. ♗e3 cxd4 9. ♘xd4 ♗g4 A pretty obvious novelty, attacking the queen with tempo. Anyway, this position is not so much about single moves. The scene is set: Black has an isolated pawn and will have to compensate by playing actively. White has a small static advantage and will try to manoeuver in order to increase it. 9... O-O transposes to the games given above. 10. ♕d2 makes a lot of sense as well, intending to put the knight on c3. 11... O-O 12. ♘2f3 ♖fe8⁈ Jonathan Rowson praised this move on Twitter, not afraid of Nxc6 followed by Ne5: I disagreed, preferring Bd6. Of course, one can read too much into a single move. My theory was - and is - Vishy has a tendency to prefer simplifications into equal or even slightly worse positions to complicated good positions against Magnus. And I believe that tendency hurts his chances. He has fixed it in the opening - 1. d4, 1...c5. We will see if it shows up in the later stages. Armchair General out. 13. ♖fe1 Declining the invitation to simplify. 13. ♘xc6 bxc6 14. ♘e5 ♕b7 15. ♘xg4 ♘xg4 16. ♗d4 ♗f6 17. c4 is what the discussion is about. While this is certainly not scary for Black, it is a simplified position where White does have a little something to work with. 16. ♘h4⁉ to stop that Bg6-Be4 manoeuver. Does the World Champion subscribe to, "a knight on the rim is dim"? I doubt it. 16... ♘g4 must have been the move that scared Carlsen away from this. 17. ♕b5! ♘xe3 18. ♖xe3 ♖xe3 19. fxe3 and the d5-pawn will fall. While there is certain compensation - yes, as a Marshall Gambit player I have seen worse - this is still much better than what White gets in the game. 18. ♘xc6 bxc6 19. c4 Statically, White is still to be preferred. After cxd5, both the pawn on a7 and the pawn on d5 (or c6) will be isolated and weak. But Black has great pieces, while the white queen looks a bit funny on f1. How to use those pieces? 19... ♗e4⁈ Keeping the status quo, but Black should compensate for his worse structure by going for activity! 19... ♗b4! 20. ♖e2 (20. ♗d2 ♗xd2 21. ♘xd2 ♖xe1 22. ♖xe1 ♕b7 23. b3⁈ dxc4 24. ♘xc4 ♗d3 ) 20... ♘e4 21. cxd5 cxd5 22. ♗d4 ♗f5 23. ♔h2 ♖c8 strikes me as one plausible line where piece power outweighs pawn weaknesses. 20. ♗d4 ♘h7 A decent move, but maybe a sign that his last move wasn't ideal. I am sure the Dark Knight would rather be on e4 (Gotham City) than on h7 (The Pit). 21. cxd5 ♗xd5 Concluding the trinity of mediocre decisions, similar to Universal allowing Michael Bay three sequels to Transformers. 22. ♖xe8+ ♖xe8 23. ♕d3 The tables have turned and Carlsen is now officially slightly better with no risk. 24. ♗c3 ♘g6 25. ♕d4 looked quite good as well and would have retained more pieces/winning chances. 24... ♗e5! This is a scenario we have also seen in the previous match. Vishy ends up in a slightly worse, unpleasant position, which could have been avoided. Once there, Vishy starts defending with great precision. He starts by exchanging the powerful d4-bishop. 25. ♗xd5 ♕xd5 26. ♗xe5 ♕xe5 27. b3 This is not fun for Black, although his drawing chances should still be much greater than White's winning chances - we do have equal material and a slightly weak white king, after all. 27... ♕e2 was a path to a holdable ending, but Anand prefers to keep the queens on the board. 28. ♘f3 ♕f6 29. ♔g2 ♖d8 30. ♕e2 ♖d5! See note to move 24. 31. ♖xd5 cxd5 Vishy has handled this with great care and should not even be worse anymore. 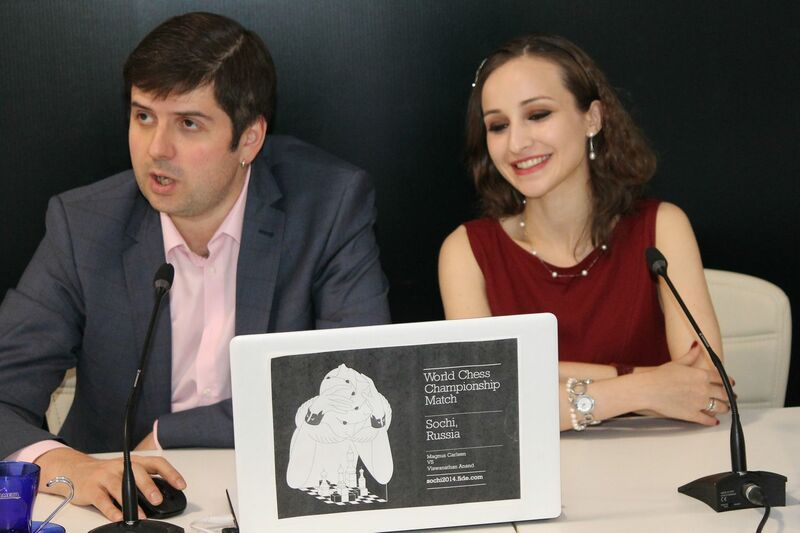 He is dealing with Magnus Carlsen, though, so there is still no handshake in sight. 32. ♘e5 ♕f5 33. ♘d3 ♘d4! Should White start to be careful? 34. ♕e3 ♕e4+ 35. ♕xe4 dxe4 36. ♘c5 f5 should end in a draw as well. 34... ♘xe2 35. gxf5 ♔f8 36. ♘b4 ♔e7! is fine for Black according to Houdini, but Anand sees no necessity for such adventures. 35. ♕e5 ♘e6 There is not much to talk about. Same old same old. White better structure, Black active enough. 38... g6 preparing to meet Qe8 with Kg7, strikes me as easier. Don't give that Norwegian Iron Man anything to work with! 39. ♔f3 d4 40. ♕e8+ ♔h7 41. ♕xf7 A pawn is a pawn, but the queen ending is drawn. 41... ♕d2 ! 42. ♕f5+ ♔h8 43. h4 It ain't over till it's over! 43... ♕xa2 44. ♕e6 ♕d2 45. ♕e8+ ♔h7 46. ♕e4+ ♔h8 47. ♕e8+ ♔h7 Draw agreed. A typical Carlsen game, in a way. A quiet opening, nothing special. All of a sudden he creates chances out of nothing. Vishy ends up slightly worse, but defends very precisely and doesn't crack. That should give him confidence! 2-2. I missed several things but I think overall it was just not a very high quality game. There were no glaring blunders, but just in general not good enough. There wasn’t really a moment I was very concerned, except when I played 39…d4, but then I saw 41…Qd2 [instead of the intended 41…Qc3+ he realised might be losing] very quickly. The score in Chennai was 2:2 after four games. Here’s it’s 2:2, so I don’t see any difference. Of course back then we’d had four draws and only one thrilling game – if the 2014 match continues at its current pace we’re in for a fantastic contest. The time control is 4 minutes per player per game + a 2 second increment per move. The prize fund is $100,000, with $20,000 going to the winner. The action starts at 13:00 CET tomorrow (the same time as the World Championship games). Stay tuned to our Live Broadcast page!